I need you to loosen the country's restrictions on change. Because the balance between countries is not right now, we are going to change the country. ps. The new server caused a lot of users to fall. We also need managers to think about innovative changes, events for users, and new users once again! I always appreciate it. We will stay in Apexko and enjoy it all the way! deadmatch event will be with drop nps . np. What is a dead match event? When patching deadmatches events, does it also allow for country changes? i were asking also to NT my clan because i donated with mine account and tukeownz all our nps but we never got any kinda of help that 1 reason why we didnt nt before when there was many orcs just the fact we need to buy recover nps scroll then pay single nt will cost too much for us also. so what to say gL with that myb gms will help u i hope for u. What are you talking about? We mostly PK during the night and right now is so dead boring, no point in login for us with no orcs. 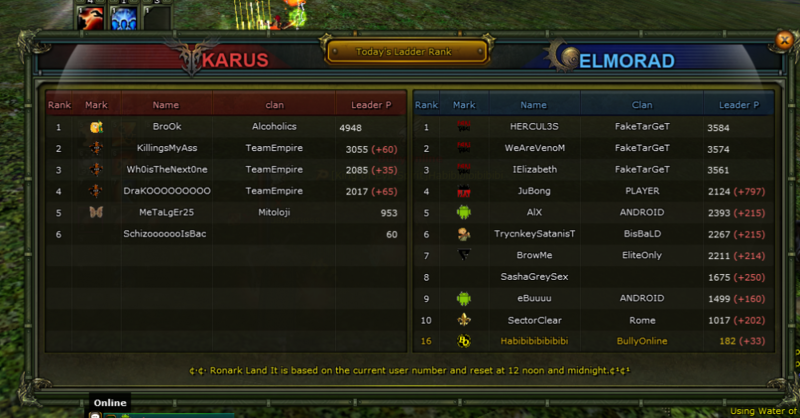 I have no idea when is 4 humans vs 50 orcs, but it is not when we're online. NT us and I assure you PK in the night will be balanced. NT over and over as it has been since server started isnt the answer because everyone will just NT again back as it has happened since the clan nt was stopped. No, this is not at all what I originally said, I don't even know how you can come up with such a ridiculous conclusion. We don't play 24/7, so we can't possibly know when humans are a minority in CZ (but it is not during our prime time). We want to help with the server balance and since being online is the only way we can do that, Timezone becomes a factor. So us being orcs or humans when we're not online doesn't actually affect the server balance, right?. If that's not clear enough, peanuts. Then perhaps have players that actually have an impact (being online) on such times of the day also share their opinions? Because [refer to point #3 above]. I'm saying, at least as far as we're online, we can (and want) to help with the server balance, and that includes fun and PK for everyone in CZ during our prime time. Unless they just want to hold hands and kill Ultima and AFK until the next day. As brook said they happy to do solo nt just dont want to have to pay for solo nt and nt scrolls and as much as Me and Brook disagree on things that is fair Help balance the server NT the Clan or give free nt scroll or np scroll to help them balance . @KissOfNeo just stop posting, don't de-rail the topic no more please. You clearly have zero reading comprehension. You just posted the same non-sense logic from your first post once again, so no point going back at you. And if you think we want to NT our clan just for personal reasons and to benefit only ourselves, well, I guess there's nothing here to discuss anymore. But this could take up to 1 month (maybe more?) our patience also has it's limits. Although we gladly support this server, if they don't hurry up and address this situation, people will stop login in, indefinitely. But this could take up to 1 month (maybe more?) our patience also has it's limits. Although we gladly support this se﻿rver, if they ﻿don't hurry up﻿ and address this situation, people will stop login in, indefinitely. Sadly its a sit and wait thing and hope its done sooner than later but nothing any of us can do in the end its upto the admin to fix the problems..